Carola Dunn was born in London and grew up in the village of Jordans, (where William Penn is buried), and attended Friend’s School, Saffron Walden. She graduated from Manchester University, moved to Southern California–by way of Fiji–and has lived in Eugene, Oregon, since 1992. She began writing books in 1979 and has been at it ever since. Carola visited Ashland, Oregon, in April 2011, as one of the featured presenters for Jackson County Reads Oregon Mysteries. Then she was off to Bristol, England for Crimefest. We caught up recently by email. EB: You’ve written over 50 books in your career. How has your writing voice changed? And how has your writing process evolved? CD: I don’t think my voice has changed much, except as required by the different periods I’m writing about. I’m more conscious now of things like overlong paragraphs, unintentional repeated words (sometimes it’s fun to do it deliberately), point of view, too many characters with name beginning with the same letter: technical oddments of the sort. The process has evolved from pen and paper on the kitchen table via a 256K green on black word processor to a Windows 7 computer. It’s evolved from 2 reference books from the library to a separate room with shelf after shelf of reference books, as well as OED online. It’s evolved from write a book then go away and do something else for a few months to a full-time job. It’s evolved from write a book, produce a synopsis, sell a book; via write and sell a synopsis, write a book; to sign a contract, come up with an idea, write a book. But it’s still a matter of developing an idea into a story with believable characters and a setting that contributes to the whole. EB: You’ve written both romance and historical mystery. What do you find is the biggest difference between the two genres? EB: You’ve recently been on tour in England and at Crimefest. What were the highlights of your trip? CD: Crimefest, a mystery conference, was fun. I was on the first panel, on the Thursday afternoon, always a bit anxious-making as many people don’t arrive till Friday or even Saturday. We were gratified to have a full house. My second panel went very well too. Conferences are about introducing one’s work to new readers, of course, but also meeting existing readers and fellow-writers. These days, it’s often a matter of coming face to face with people one already knows via the internet. I find conferences equally exhausting and invigorating. After that, I went to Cornwall to do research for my next Cornish Mystery—a rainy day in Truro and Falmouth and two glorious sunny days on Bodmin Moor and the cliffs of the north coast. From the research point of view, the highlight was meeting a man in the Maritime Museum in Falmouth who had worked on freighters sailing the seven seas from Falmouth: What he told me about the shipping in the 1960s exactly fitted what I needed for my story. Next stop Worcestershire, researching for the next Daisy Dalrymple mystery, when Daisy returns to her childhood home on the bank of the River Severn. Again, a very useful few days. EB: I know that you take great effort to accurately portray the time period you write about in the Daisy Dalrymple series. How much of your work time is devoted to research versus writing? CD: I can’t possibly give you numbers. While I do some research before I start writing, a lot of it takes place as I write, as questions arise. Thinking—both conscious and unconscious—probably takes more time than either. Ideas are as likely to pop up at 2 a.m., or when I’m walking the dog, as when I’m sitting at the computer. You can’t turn off your mind and it’s working 24/7. EB: Your books are available now as ebooks, audiobooks, and in hardcover, paperback and even large print. What do you think accounts for their enduring popularity? EB: How do you keep connected with your readers? 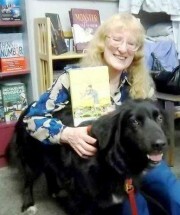 CD: Through my website and blog [http://CarolaDunn.weebly.com] with comment and email connections; responding quickly to emails received; Facebook; and I send out a brief email newsletter to people who have contacted me, whenever a new book comes out. At those times, I also do book-signings at stores up and down the West Coast, mostly independent mystery bookstores. EB: You’ve recently added a new character in a second series—Eleanor Trewynn, a widow who’s retired from international charity work to a village in Cornwall. What prompted you to start a new series? CD: The advance of old age. Regencies generally have young heroines—my oldest was 42. Daisy has been in her 20s for 20 books now. I wanted to write about a protagonist nearer my own age. Plus, though my books are far from formulaic, I needed to do something different, write about a different period with a different zeitgeist. EB: You’ve worked with the same publisher and same editor for many of your books—what makes for a good author-editor-publisher relationship? CD: Writing Regencies, I had four different publishers, and more than one editor (sequentially) at most of them. I was lucky that each was replaced with a new editor who also liked my work. I’ve been even luckier with my mysteries, in having an editor who likes my work and believes in it and, even better, he’s stayed at St. Martin’s. Often when an editor moves to a different publisher, he (or she) is unable to take his authors with him; often the new editor moving in doesn’t have the same enthusiasm for a particular author. A good relationship: Turn in a clean manuscript on time (“clean” meaning that when it comes back from the copy-editor it isn’t a sea of red ink). That said, my last two manuscripts have been past deadline, and the next will be even later. I’ve been on time for so long, though, that I’m allowed a certain leeway! The obvious: be pleasant in all your dealings with your agent and editor; don’t get shirty when suggestions for changes are offered. But take them as suggestions, not orders. It’s your work. And last but not least, leave the business side of things to your agent and get on with the writing. She’s there so that you don’t have to approach your editor with a request for more money. EB: What’s indispensible to an author? EB: Who do you like to read? 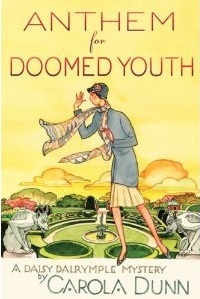 CD: Given that I chose to write about the 1920s, it will be no surprise to learn that I love the Golden Age mysteries, from Freeman Wills Crofts to Patricia Wentworth. Many later mysteries, too—a list of authors would be very lengthy. Two of my non-mystery favourites are Tolkien and Jane Austen, and a regular reread is The Hitchhiker’s Guide to the Galaxy (my dog is named after a character). I read some history and quite a bit of science for non-scientists. Oliver Sacks and Jared Diamond come to mind. In “general fiction,” I’ll try almost anything but often put books down without getting very far. Standouts I happened across in the past few years are Elizabeth Rossner’s The Speed of Light, Ursula Under by Ingrid Hill, and The Hotel on the Corner of Bitter and Sweet, by Jamie Ford. I like books that end on a positive note. There’s enough bad stuff in the news. EB: What’s next for your two mystery series? CD: The 20th Daisy Dalrymple mystery, Gone West, is “in production.” I have a contract for a 21st, probably titled Heirs of the Body. 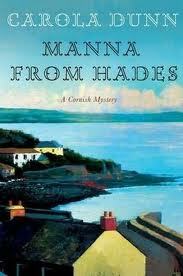 I’m presently writing the third Cornish mystery, Valley of the Shadow. I only recently came across a Daisy Dalrymple, ‘Mistletoe and Murder’, for the first time and read it with pleasure. Like the characters.Shall certainly be looking for more in my local Waterstones bookshop. Found this interview very interesting indeed. This is a wonderful interview — and such great advice on the editor-writer relationship. These book covers are gorgeous! What atmospheric places must inform your work, Carola! I hope to go to CrimeFest myself before too long. Thanks for the interview–it was very informative.